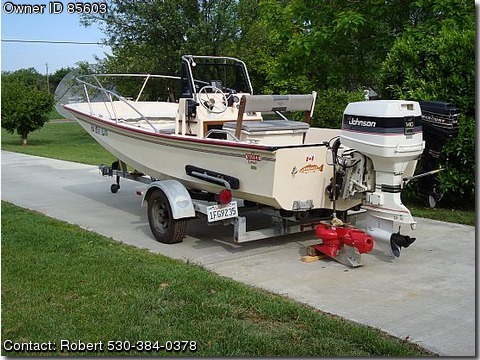 2 Anchors, Downriggers, 3 Rod Holders, Depthfinder, EAGLE Z-6000 fish finder, Speedometer, CMC Hydraulic Jack Plate, Outboard Jet Unit for shallow water, SCOTTY electric downrigger, Safety Jackets, Single axle SHORELINER galvanized trailer with 2 new tires plus a spare tire, Battery, Plus Mercury 9.9hp auxilliary motor with very low hours is operated from the center console. Due to the fact that my work assignments took me out of the country the boat was used 2-3 times per year. 90% of the time the boat has been in fresh water and is in Very Good Shape. This boat has always been stored under the roof and was always weather protected. Both of the boat engines were professionally tuned last year.